Last year I was in New York City on the hottest three days of the year. It was unbelievably hot and the only thing to do at night was to walk around Times Square in the pouring rain. I should be used to the heat from Florida, but it was no easier. Nevertheless, the rain and lights created fantastic photo opportunities that are entirely different than those I get back home. A nice effect is how the rainwater creates a reflective sheen on the pavement. Taking photos at night in a city is a matter of experimentation. With a camera, we have several choices to make. A wide aperture combined with a high ISO allows a type of street photography without a tripod. However, with a tripod, we can take longer exposures if we want to capture light trails. In this case, I just wanted to capture images of the scene without special effects. For me, the most exciting thing was watching people out having fun in the rain; which by the way, was what I was doing also. After a rainy day last week the wind died down in the evening. When that happens, the water in the river becomes smooth like glass, which is the perfect time to take pictures. I made this near my home in Palmetto, just off the road next to the bridge. This scene is an HDR image made of four frames with different exposures. By combining frames, the greenery and sun appear without either appearing blown-out. I use Aurora HDR from Skylum to process my HDR compositions. After mixing the frames, I usually make three or four additional adjustments to get it just the way I want it. I may also process it in Luminar which is another tool from Skylum. This area is a little section by the river that few people notice. It’s next to a major road that thousands drive by each day. As for me, I believe a photographer should work close to home as a way to practice seeing the familiar with new eyes. Seeing something new in the usual, or looking at it from a different perspective is a useful skill at home and abroad. So if you happen to be driving to work and see me standing by the river, now you’ll know why. 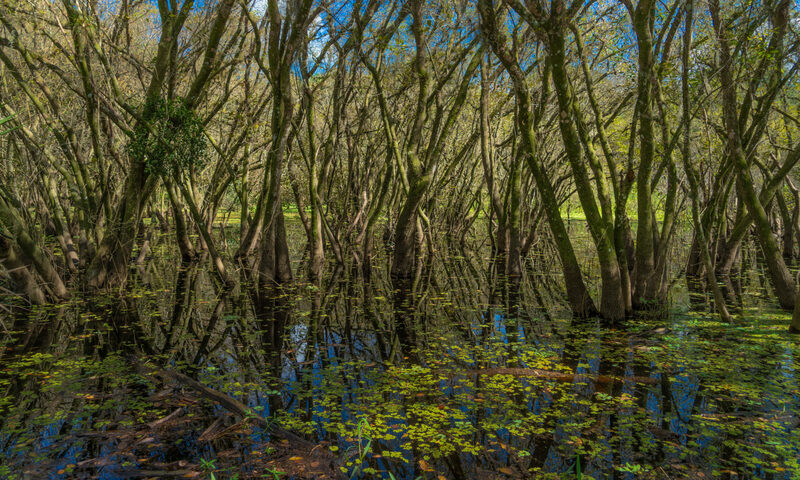 This image is another from the series I took while visiting Neal Preserve in Bradenton. The dry season is over, and thundershowers are now a regular occurrence until the end of summer. Water fills the ponds which in turn creates photo opportunities like this. Only a few weeks back this might have been bone dry. The image is an HDR; it’s a combination of five shots of different exposures. Because I was shooting directly at the sun, I took exposures from -4 to 0. The software that I use, Aurora HDR, is smart enough to pick out the best from each frame to combine into one. Then I use the sliders and masking techniques to adjust the saturation, shadows, and highlights. After a while, it started to have a look and feel I was trying to uncover. Processing a photo is like polishing a stone, you work at it until it shines. That’s a simple analogy but aptly reflects the process. So often I’ll look at the raw photo that I have sitting in my library and think to myself it has little or no potential. But then, perhaps out of curiosity, I begin working on it and sometimes, I get a real gem. Not always, but enough times to keep me coming back for more. Here is a shot I took last year on my last night in Barcelona. I was “stuck” there while a Hurricane passed through my home in Florida. It’s not something I’d wish on anyone, but as long as we were stranded, I could think of no better place to be. Barcelona has a unique energy to it, and it’s super easy to pass the time. In a city like this, people are out walking and socializing late into the night. It’s fun to be in the middle of it all while taking photos. For whatever reason, nighttime street photography is something that gets my creative juices flowing. There is something about the lighting that changes the mood completely. The path in this image is a classic leading line. With our eyes and imaginations, we follow the trail and perhaps feel it leads to a safe place. That is the central principle behind this image, and it should be convincing as long as you don’t think about the bugs.